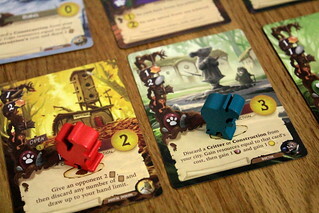 Everdell is a worker placement and tableau building game played in four rounds, corresponding to the four seasons. You start in winter with only two workers. One more joins you at the start of spring and summer, two in autumn. Especially early in the year that’s not a lot of workers at all. Fortunately, they’re not needed for everything you’ll want to do. Your worker’s main job, especially in the early game, is to supply you with resources. Action spaces along the river on the big game board let them collect wood, stone, amber and berries in different combinations. Workers can also bring back hand cards from here. Those are also a kind of resource as you only draw them from actions. Besides the regular spots for workers printed on the board you also have a selection of three or four cards laid out that offer more actions. Many of those are also for gathering resources, but some other options are available here. The game proceeds as you would expect, players take turn taking an action until no one wants to take more actions. Placing a worker is one possible action. The other is to expand your city and add a card to your tableau. There are two options where a card can come from. It can come from your own hand, or it can come from the Meadow, a space on the main board that holds eight cards all players can access. It doesn’t matter where they come from, you play them the same way. Pay the required resources and place the card on one of the fifteen spots in your tableau. About half of the cards are Constructions, the other half are Critters. 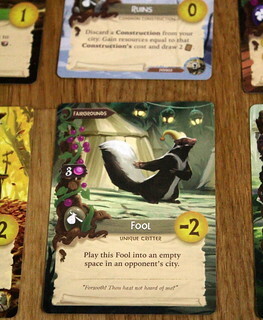 Many Construction cards show a Critter in the lower right corner. If you have the Construction you can play the Critter without any further resource costs. It seems Field of Dreams was right, after all. If you build it, they will come. Build a Courthouse and sooner or later a Judge should happen. If the card is Critter or Construction doesn’t matter much for what it can do to you. For that, the card’s color is more important. The brown Traveler cards are the simplest ones. You activate their effect when you add the card to your tableau, after that it’s only benefit are victory points. Those cards are prime candidates for the few effects that let you remove cards from your city again. Next, and more interesting, are green Production cards. Their effect – usually supplying resources – is also triggered when the card is played. It triggers again before Spring and Autumn, giving you a reliable but not abundant supply of the resource they produce. Most green cards have a fixed production, but some give you useful choices like copying another one of your production cards, or even an opponents’. Red Destination cards are especially interesting even though they don’t have an immediate effect. Instead, they have a spot for a worker where you can trigger an action. The most interesting and interactive actions are to be found here, actually, not on the main board. For instance, the Post Office let’s you send two cards to an opponent, discard as many more cards as you want, and then draw cards up to your hand limit. Or take the Cemetery. Placing a worker here lets you draw four cards from the draw pile or discard pile and then play one of those cards for free. The downside is that the worker you send to the Cemetery will not return at the end of the season. Now that I think about it, I don’t think they are there to work as grave diggers. Then we have blue Governance cards that have an effect when triggered by something else you do. If your city has a Courthouse and you play a Construction card you get a free resource of your choice. Who knew justice could be so profitable? Finally, purple cards score extra points at the end of a game, based on a range of conditions you have to meet. In most seasons you will spend more actions playing cards that placing workers, so only having two workers in Winter really isn’t a big deal. Or any deal. Even this early in the game you can make a big contribution to your resources with Production cards. There is one thing, though, that will always need workers: Events. Events are handy little things that give you extra points for collecting them. All you need is to meet their condition first. There are four basic events that you may collect when you have enough cards of the right color in your city and that give you a flat victory point bonus. There are also four Special Events each game, drawn from a big selection of random ones. They usually need you to have specific cards in your city and have more intricate scoring rules. Often that involves paying resources when you collect the cards, making the timing when you collect it crucial. You do that for four seasons, and the game is over. Someone will have more victory points than everyone else and win the game, but more importantly the realm of Everdell will have some flourishing, new towns. Let’s get one big thing out of the way first. Everdell looks absolutely amazing. With the Collector’s Edition I can’t decide what is prettier, the regular lid or the box sleeve, but most of the really beautiful stuff is in the regular edition as well. High quality resource pieces, a giant Ever Tree whose branches hold some of the components, and beautiful, beautiful, absolutely beautifully cards illustrated by Andrew Bosley. 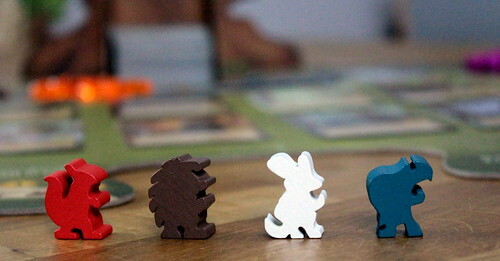 And, most relevant to us, worker meeples in the shape of hedgehogs, squirrels, turtles and mice. There is only one minor downside to the components: you can’t sit behind the Ever Tree with any hope to play. So better get creative with where you turn that board. In terms of game mechanisms, I’m having a hard time to come up with any complaints at all. The worker placement bits are not hugely innovative, but solid. What truly makes Everdell shine, however, is how worker placement and tableau building mesh together. At no point does it feel like those are two separate parts of the game, everything is part of your plan to build a town of critters. With the four different resources to keep in mind, plus hand cards, plus your precious workers, plus the limited space in your new city you have a lot of things to keep in mind. Nevertheless, Everdell never fells slow. Waiting times between turns only really become a thing once you hit Autumn. There’s also a really good level of interaction. 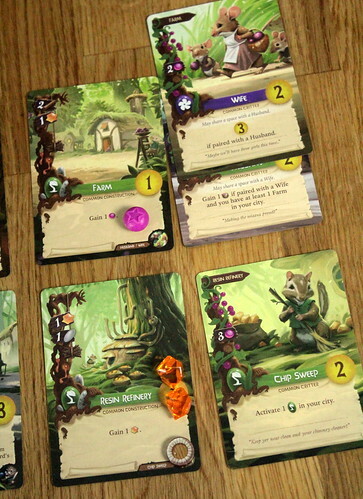 Worker placement is usually a good mechanism to keep a game interactive, and the limited space to do what you want works well in Everdell, too. Tableau building games sometimes have a problem with interaction and feel like everyone is just puttering away on their own. Not a problem here. The shared cards from the meadow are incentive enough to keep a close eye on your opponents’ tableaus and pick up cards from there just so they can’t get them. That you can send your workers to Location cards in other players’ town is just the cream on top of that. There is very little in the way of negative interaction in Everdell, you only have one option to mess with other players’ towns. That option, however, the Fool, can be very mean with the right timing. If you want a more peaceful game there’s no real downside to removing that card. Like I said, I can find little to complain about. Everdell is a beautiful game that might not break new ground in either of its main mechanisms but mixes them together seamlessly into a highly enjoyable game. And thanks to a couple of random elements in the setup every game will feel truly different.